There are plenty of great products out there on the market that are great alternatives to declawing. With some time and a little bit of patience, you may find the perfect product for you and your scratchy kitty. 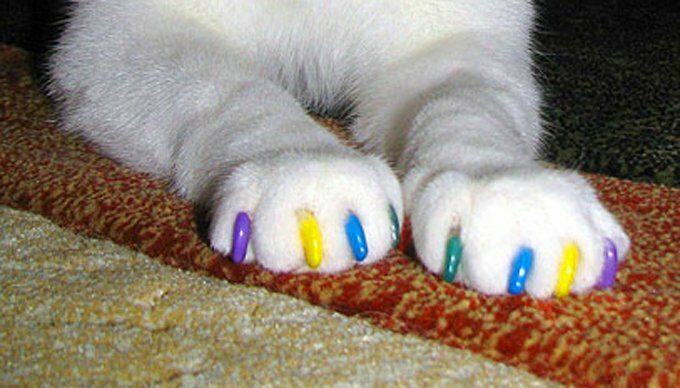 Soft Paws are one alternative to declawing: They are small vinyl caps that fit over your cat’s claws. To aid in redirecting your kitty’s behavior, you may have to make the former object of your kitty’s desire less desirable. Curb your kitty’s couch-clawing by removing his scent from the object. Thoroughly clean the piece of furniture, and use a quality pet odor removal solution as directed to get even the most saturated cat smells out of fabrics. Sprays containing citrus odors make a great deterrent; however, before you go spraying your brand-new living room set in lemon scent, make sure the spray is both non-toxic and non-staining. Cats dislike sticky textures, so try placing strips of double-sided tape on the piece of furniture for a couple of days. Sticky Paws, a product that comes in strips, rolls, and sheets, is another icky-sticky option that cats hate to touch with their paws. SENTRY Stop That is a behavior-prevention spray for dogs and cats. Designed to stop the unwanted behavior as it is occurring, Stop That emits an attention-getting noise and calming pheromones that reduce excitability when sprayed as directed. To take the ouch factor out of your kitty’s claws, Soft Paws are small vinyl caps that can be adhered to the claw with some surgical glue. The caps are comfortable for kitties, come in a variety of fun colors, and are made of non-toxic materials. One set of Soft Paws usually lasts four to six weeks before needing to be replaced. Please note that these are not recommended for outdoor cats.